where is the response probability to be modeled for the binary response Resp and LDose = log( Dose +1) is the covariate. The dose levels are 0 for the control group, and they are 1, 3, and 6 for the three treatment groups. where is the variance of the response variable in the logistic regression model, is the proportion of variance of LDose explained by other covariates, and is the variance of LDose. The null hypothesis corresponds to no treatment effect. Suppose that the alternative hypothesis is the reference improvement that should be detected at a 0.90 level. If the same number of patients are assigned in each of the four groups, then the MLE of the variance of LDose is . Further, if the response rate is 0.40, then the required sample size can be derived using the SAMPLESIZE statement in the SEQDESIGN procedure. The following statements invoke the SEQDESIGN procedure and request a three-stage group sequential design for normally distributed data. The design has a null hypothesis of no treatment effect with early stopping to reject the null hypothesis with a two-sided alternative hypothesis . The ODS OUTPUT statement with the BOUNDARY=BND_DOSE option creates an output data set named BND_DOSE which contains the resulting boundary information for the subsequent sequential tests. The "Design Information" table in Output 90.8.1 displays design specifications and derived statistics. Since the alternative reference is specified, the maximum information 47.22445 is derived. The "Boundary Information" table in Output 90.8.2 displays the information level, alternative reference, and boundary values at each stage. By default (or equivalently if you specify BOUNDARYSCALE=STDZ), the boundary values are displayed with the standardized Z statistic scale. 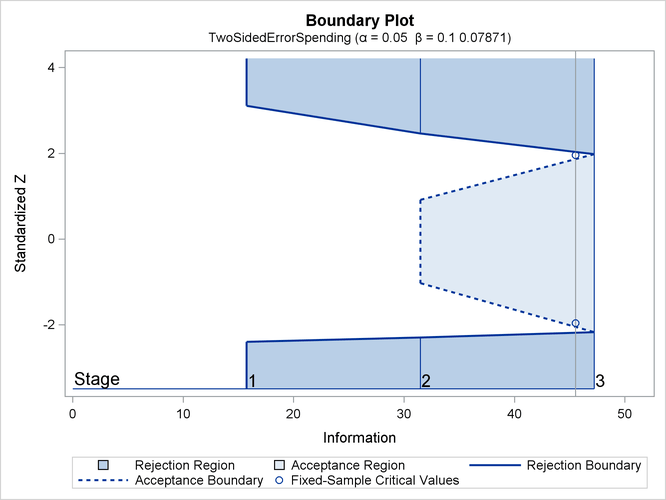 With ODS Graphics enabled, a detailed boundary plot with the rejection and acceptance regions is displayed, as shown in Output 90.8.3. With the SAMPLESIZE statement, the "Sample Size Summary" table in Output 90.8.4 displays the parameters for the sample size computation. The "Sample Sizes" table in Output 90.8.5 displays the required sample sizes for the group sequential clinical trial. That is, 123 new patients are needed in each stage and the number is rounded up to 124 for each stage to have a multiple of four for the four dose levels in the trial. Note that since the sample sizes are derived from an estimated response probability and are rounded up, the actual information levels might not match the corresponding target information levels. Output 90.8.6 lists the first 10 observations of the trial data. The BOUNDARY= option specifies the input data set that provides the boundary information for the trial at stage 1, which was generated in the SEQDESIGN procedure. 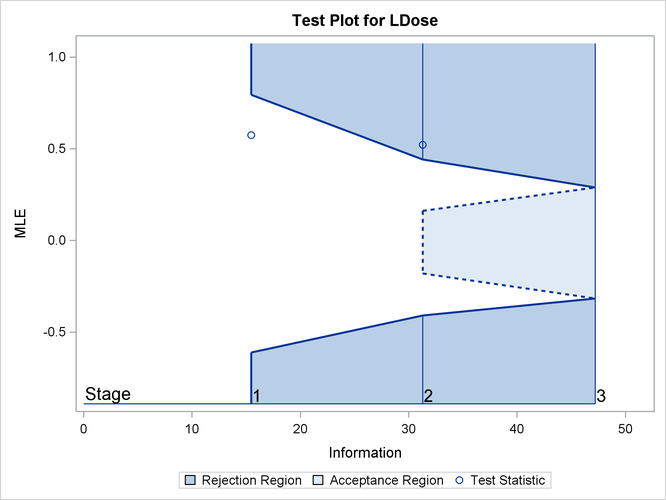 The PARMS=PARMS_DOSE1 option specifies the input data set PARMS_DOSE1 that contains the test statistic and its associated standard error at stage 1, and the TESTVAR=LDOSE option identifies the test variable LDOSE in the data set. If the computed information level for stage 1 is not the same as the value provided in the BOUNDARY= data set, the INFOADJ=PROP option (which is the default) proportionally adjusts the information levels at future interim stages from the levels provided in the BOUNDARY= data set. The ORDER=MLE option uses the MLE ordering to derive the p-value, the unbiased median estimate, and the confidence limits for the regression slope estimate. The ODS OUTPUT statement with the TEST=TEST_DOSE1 option creates an output data set named TEST_DOSE1 which contains the updated boundary information for the test at stage 1. The data set also provides the boundary information that is needed for the group sequential test at the next stage. The "Design Information" table in Output 90.8.8 displays design specifications. By default (or equivalently if you specify BOUNDARYKEY=ALPHA), the boundary values are modified for the new information levels to maintain the Type I level. The maximum information remains the same as the design stored in the BOUNDARY= data set, but the derived Type II error probability and power are different because of the new information levels. The "Test Information" table in Output 90.8.9 displays the boundary values for the test statistic with the specified MLE scale. 0.6636 31.33753 -0.50000 0.50000 -0.40974 -0.18169 0.16222 0.44033 . 1.0000 47.22445 -0.50000 0.50000 -0.31633 -0.31633 0.28860 0.28860 . With the INFOADJ=PROP option (which is the default), the information level at stage 2 is derived proportionally from the observed information at stage 1 and the information levels in the BOUNDARY= data set. At stage 1, the boundary values are missing and there is no early stopping to accept . The MLE statistic 0.57409 is between the lower and upper boundaries, so the trial continues to the next stage. With ODS Graphics enabled, a boundary plot with the boundary values and test statistics is displayed, as shown in Output 90.8.10. As expected, the test statistic is in the continuation region below the upper alpha boundary. The ORDER=MLE option uses the MLE ordering to derive the p-value, unbiased median estimate, and confidence limits for the regression slope estimate. The ODS OUTPUT statement with the TEST=TEST_DOSE2 option creates an output data set named TEST_DOSE2 which contains the updated boundary information for the test at stage 2. The data set also provides the boundary information that is needed for the group sequential test at the next stage. The "Design Information" table in Output 90.8.12 displays design specifications. By default (or equivalently if you specify BOUNDARYKEY=ALPHA), the boundary values are modified for the new information levels to maintain the Type I level. The information is derived from the standard error associated with the slope estimate at the final stage and is larger than the target level. The derived Type II error probability and power are different because of the new information levels. The "Test Information" table in Output 90.8.13 displays the boundary values for the test statistic with the specified MLE scale. The information levels are derived from the standard errors in the PARMS= data set. At stage 2, the slope estimate 0.52128 is larger than 0.44091, the upper boundary value, the trial stops to reject the null hypothesis of no treatment effect. 1.0000 47.22445 -0.50000 0.50000 -0.31628 -0.31628 0.28861 0.28861 . With ODS Graphics enabled, a boundary plot with the boundary values and test statistics is displayed, as shown in Output 90.8.14. As expected, the test statistic is above the upper boundary in the upper rejection region at stage 2. After a trial is stopped, the "Parameter Estimates" table in Output 90.8.15 displays the stopping stage, parameter estimate, unbiased median estimate, confidence limits, and the p-value under the null hypothesis . With the ORDER=MLE option, the MLE ordering is used to compute the p-value, unbiased median estimate, and confidence limits. As expected, the p-value 0.005 is significant at the level and the confidence interval does not contain the null reference zero. With the RCI option, the "Repeated Confidence Intervals" table in Output 90.8.16 displays repeated confidence intervals for the parameter. For a two-sided test, since the rejection lower repeated confidence limit 0.0804 is greater than the null reference zero, the trial is stopped to reject the hypothesis. 15.4506 0.57409 -0.2193 1.1849 . .
With the PLOTS=RCI option, the "Repeated Confidence Intervals Plot" displays repeated confidence intervals for the parameter, as shown in Output 90.8.17. 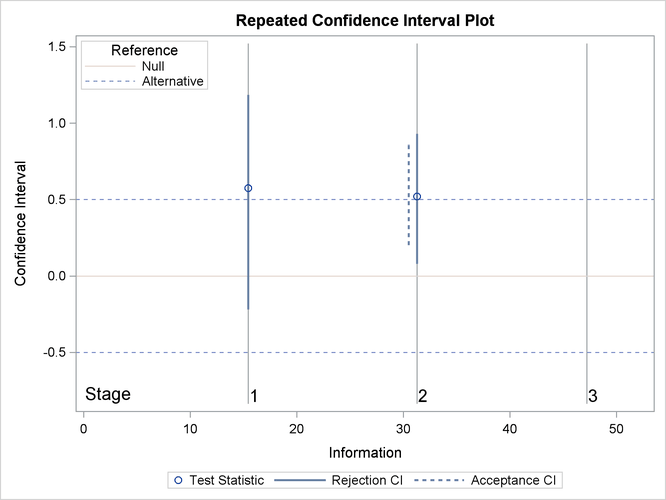 It shows that the null reference zero is inside the rejection repeated confidence interval at stage 1 but outside the rejection repeated confidence interval at stage 2. This implies that the study stops at stage 2 to reject the hypothesis. Note that the hypothesis is accepted if at any stage, the acceptance repeated confidence interval falls within the interval of the alternative references.